Asymmetric relations such as lending money, doing favors and giving advice form the basis of mutual aid and cooperation in human societies. However, they also provide a mechanism for the emergence of inequalities and hierarchies. Reciprocal behavior at the dyadic and network levels can prevent the aggregation of unequal exchange into unfair macro-level outcomes. 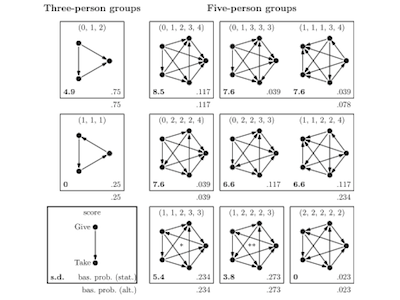 In a project with Vincent Buskens, I investigated the conditions under which a group of individuals is more likely to develop a social norm of reciprocity and coordinate on efficient and egalitarian structures from asymmetric dyadic relations. We conducted a laboratory experiment on a version of the Hawk-Dove Game in which subjects interact repeatedly by choosing both their partners and actions towards each of them. Our results indicate that smaller groups are more likely to coordinate on egalitarian equilibria than larger groups and that norms of direct reciprocity are more likely to emerge than norms of indirect reciprocity. We further found out that although the equilibria are egalitarian in terms of payoffs, they imply a dominance hierarchy regarding the distribution of actions. The resulting paper can be found here.